Looking for the perfect system to take care of ticketing, issue reporting and fixing, or an assignment tracking system? Tickets: Could also be called assignments or issues. Use this to add tickets, assign them to people, and then track progress on the tickets. Comments: Add comments to tickets, with multiple levels of comments, and be able to see who commented on the ticket and when to keep track of progress. Activity: Whenever you make changes on the ticket itself, the changes are tracked so that you can see who made changes to the ticket and when. Reports: See which user or group made the most requests, or which tickets took up the most time to work on, using the system reports. 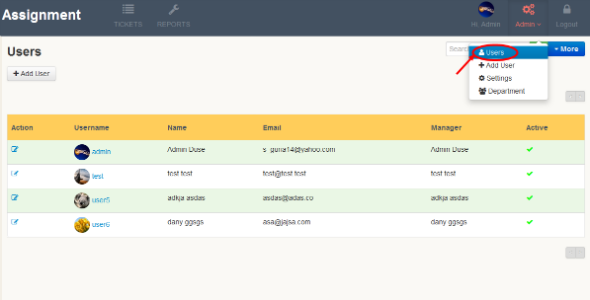 You can see details by user or group. This entry was posted in Uncategorized and tagged assignment, database, feeds, forms, issue, media, php, scripts, sliders, ticketing, tracking by Acty. Bookmark the permalink.